New app aims to make MRI safety accessible for everyone. People often think of MRI as being safe because it doesn't produce ionizing radiation. As with any powerful piece of machinery, however, it's extremely important to follow necessary precautions when operating—or even being in the vicinity of—an MRI scanner. Although most MRI safety incidents don't result in patient harm, the potential for harm is significant. Perhaps the most publicized case of patient harm occurred in 2001 when a 6-year-old boy was struck and killed by an oxygen tank that was pulled into an MRI machine, but there have been several near misses in the years since. In April of this year, a Massachusetts man narrowly escaped injury when a gurney he was lying on became ensnared in an MRI machine's magnetic field. 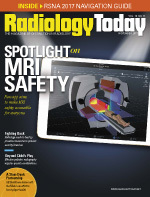 Emanuel Kanal, MD, FACR, FISMRM, a professor of radiology and neuroradiology and director of MR services in the department of radiology of the University of Pittsburgh Medical Center Health System, says MR safety can be confusing for those who aren't trained in its subtleties. Kanal serves as a consultant to the FDA on MR safety and has chaired or served on numerous MR safety committees for more than 30 years. He created the first MR safety website in 1995 and cowrote the first MR safety book. "To generate a chest X-ray, we irradiate the chest with a single energy source, X-rays, and direct them over—and only over—the chest. To perform an ultrasound of the liver, we irradiate the liver with ultrasound energy," Kanal says. "To generate a single magnetic resonance image, the entire patient is placed within a strong magnetic field, and, while in this powerful magnetic field, a significant percentage of the entire patient is then irradiated with radiofrequency [RF] oscillating magnetic fields—loosely referred to as radiowaves. "While all of this is occurring," Kanal continues, "gradient magnetic fields, which also cover much of the patient's body but are quite differently distributed in space, are turned on and off thousands of times per second. When it's all done, you generate an MR image representing a 5 mm slice of the patient's body. MRI uses multiple energy sources directed at various and differing parts of the patient, the majority of which are not part of the anatomy or volume being imaged! Each energy field has its own unique safety issues, which are independent of each other, and each may present potential hazards in areas of the body that are not being imaged. It's unlike any other type of medical imaging, and the potential safety issues are complex and entirely nonintuitive." Each energy field is associated with its own potential hazards and requires its own unique precautions. The static magnetic fields affect certain metals, which can cause some foreign bodies or medical implants to move or malfunction. RF energy fields can cause burns in certain circumstances. Gradient magnetic fields can result in unintended neurostimulation and loud noises. "Some of the energies to which the patient and implant will be exposed in routine MR imaging are maximal at locations that can be inches or even feet away from the anatomy being examined," Kanal says. "For example, while performing an MRI of the brain, the MR imaging gradient magnetic field energies might be maximal over an abandoned pacing lead in that patient's heart and may induce arrhythmias, even though the lead is quite remote from the brain that is being imaged." Thousands of people have signed up for Kanal's multiday MR safety courses; more than 3,500 have attended since 2014. Kanal has developed a well-received MR safety app that he uses as a teaching tool for these courses. A licensed, instrument-rated pilot, Kanal modeled his first app after the checklists that pilots use to assist them during flight. It offers comprehensive guidance, but—much like an airplane requires a trained pilot—it requires a certain level of knowledge to be used effectively. Designed for the iOS platform, Kanal's first app consists of a series of screens that ask the user questions to determine whether it's safe to perform an MRI on a patient who has an implant or foreign body. For this decision tree to be effective, however, the user is required to have a working knowledge of MRI safety. With his new app, Kanal intends to demystify MRI safety for all medical personnel. "The first app requires MR safety domain expertise, but there are so few of those people compared with those whom we're trying to target, which is every single MR center in the world, every technologist, every radiologist," Kanal says. "What I'm trying to do with this app is highlight computerized radiology assistance, which is where our field is headed." The new app, named Kanal's MagnetVision™, can be used by any radiologist or MR technologist. The only information it requires is the patient's gender, height, and weight; the MRI system that will be used; and the position the patient will be placed in within the scanner. No protected health information is required. The app's tagline is "Making the invisible — visible™." Rather than requiring a pilot—a trained MR medical director, MR safety officer, or MR safety expert—Kanal's new app is more like a heads-up display for a self-driving car. The app is compatible with the iOS operating system and can be used on a tablet or smartphone. As with his first app, Kanal retained the award-winning, United Kingdom-based iCat Solutions Ltd, headed by George Michalopoulos, to develop the app. It is currently in beta testing, and Kanal intends to make a formal announcement about it at this year's RSNA. To demonstrate the app's capabilities, Kanal gave Radiology Today a sneak preview. It allows a person with no MR safety expertise to create a HIPAA-compliant patient profile and check relevant safety parameters in a virtual reality environment. Various modes allow the user to create a patient's avatar, implants, and exam settings in nearly lifelike detail. The patient's height, weight, and gender are entered in the "Waiting Room," and the patient's body morphology can be modeled to ensure a proper approximation of the real patient. The app can also model patients who are pregnant. Users can create a complete, patient-specific profile if they wish, but height, weight, and gender are all that are required to make a functioning model. In the "Implant/Factory Room," users can select and/or create implants, devices, or foreign bodies. Implant types, dimensions, and materials can be selected, designed, and manipulated to mimic what's inside the real patient, including stents or even bullets. FDA labeling information can be included, if it's known. If a user doesn't know all of the details, the app will produce a model based on what is known, or the user can define his or her own safety thresholds for each energy field. When it's distributed, the app will include a list of premade implants that can be selected. In the "Operating Room," the selected implants or foreign bodies are then "implanted." Implant models can be positioned exactly as they are situated in the real patient, and just about any region, organ, or organ system in the body can be isolated for better visualization. There is no limit to the number of implants that can be created and placed in a patient model. Kanal says determining implant placement is important because the effects of the MRI scanner's magnetic field will change depending on where the implant is in the patient, which alters the energy fields and magnitudes it will encounter as the patient is advanced into the MR scanner. Once the patient has been modeled and the device implanted within the patient's avatar, users can select from a variety of manufacturers' MR scanners in the "Magnet Room." Kanal says several MR manufacturers have provided the specifications for the 3D energy fields used in their scanners so that users can see how specific magnets, gradient coils, and RF coils will affect their patients. The app produces a virtual reality representation of the static magnetic fields, imaging gradient magnetic fields, and RF magnetic fields that the patient will be exposed to in and around that scanner. "For example, to predict potential translational attractive forces exerted by the MR scanner's strong magnetic fields on an implanted device, one would need to know the strength of the magnetic field as well as the strength of the magnetic spatial gradient to which the implanted device will be exposed as it passes through, into, and then out of the MR scanner. That has to be compared against the FDA-approved labeling of the implanted device to see if, at any time, the device would be exposed to energy levels that exceed what have been shown to be safe. That takes significant knowledge and MR safety expertise that most sites just don't have," Kanal says. "This app automatically models all of these parameters and graphically shows this information to the user. If the implanted device and its 'breadcrumb' trail of colored balls are displayed as green while the patient is advanced to scanning position in the MR scanner, this indicates that the device is exposed to MR energies that are within FDA-approved labeling limits. If the device and breadcrumb trail turn yellow, the energy exposures are closing in on the FDA-approved threshold levels for that device. If they turn red at any location, published FDA-approved MR-safe labeling conditions can be expected to be exceeded at that location if that patient and their implanted device undergo the planned MR imaging study as designed." In a similar fashion, the app displays the relative strengths of the transmitted RF energies over the RF-irradiated volume or anatomy of the patient, as well as the relative strengths of the imaging gradient magnetic fields that the patient's anatomy and implant will be exposed to in the pending MR study. One of the app's features can remove or erase selected parts of the magnet or the entire magnet to allow users to visualize the various energy fields that the patient will be exposed to in the MR scanner. "This app models my patients, together with their implants, in the specific MR scanners within which I am about to scan them," Kanal says. "The app permits the user to 'break open' the MR scanner or to render part or all of its components transparent, in order to enable the user to see what's happening inside the magnet at all times as the patient is moved into position for imaging. "The invisible fields are being turned visible by the program," Kanal says. "The purpose is to take the invisible energies that we can't see and, from a teaching point of view, provide a three-dimensional understanding of where they are and how strong they are at different locations in and around the MR scanners that are being modeled—and to which our patients and their implants are about to be exposed." Starting October 2017, Kanal's MagnetVision™ will be distributed at no charge to anyone who attends one of Kanal's MR Medical Director/MR Safety Officer Training Courses. The first course in which it was used took place October 22–25 in Boston. Kanal sees the app as a manifestation of trends that are already becoming apparent in radiology. He cites automated execution of radiology examinations, automated image identification of anatomic structures, and machine learning-based pattern recognition as examples of technology augmenting radiology practice. In addition to medical personnel, he says administrative personnel will also be able to use derivative versions of the app to track MRI-related metrics. Kanal believes that, in the future, MRI manufacturers may adopt forms of decision support technology that are similar to his app. Despite the possibilities, however, Kanal stresses that technology will not replace humans but is there to assist them. "There's no human that can fly as precisely as an autopilot, in most circumstances. As pilots in command constantly pursuing better cockpit resource management, we are taught the importance of mastering the autopilot, which itself requires technical expertise. But, if something happens with the automation, or if a given situation overwhelms the capabilities of the autopilot, you need to be able to immediately step in and take over," Kanal says. "For the foreseeable future, we will still require the human to ultimately serve as the pilot in command when it comes to overseeing the safe execution of MR imaging examinations."